Not every guy has one, but most covet it. Folks, we’re talking about the proverbial man cave! It’s a place where boys can be boys; you can lounge in your favorite chair, watch sports and do all things manly. But why settle for a dark and dingy basement when you can create the ultimate man cave in your back yard? But be forewarned, you’ll probably have to share with the family! In honor of National Men’s Health Month, we thought we’d share some ideas about how a hot tub can serve as the catalyst for transforming your back yard into the ultimate man cave where you can relax after a long day, entertain friends or just reconnect with your family. Not all hot tubs are created equal. In fact, there are some hot tubs on the market that promise a lot, but don’t quite deliver. With a Master Spas hot tub, you can rest assured that you’ve bought a superior hot tub designed to give you the full relaxation experience with minimal maintenance. With features like EcoPur® Charge filtration, peaceful waterfalls, built-in Bluetooth® stereo systems and tranquil underwater LED lights, you can channel your inner zen while relieving sore or fatigued muscles. On the chance that you’re in a sharing mood, a hot tub also creates a place where you and your significant other can connect and have real quality time. As most people aren’t bringing their mobile devices near water for fear of it being irreversibly damaged, everyone can disconnect and unwind at the end of a long day. Studies also show that soaking in a hot tub before bedtime can help you sleep better. Basketball finals? Yes, please! Install a TV close by, or connect to your iPad® using our waterproof case and mount to enjoy watching your favorite win the big game. Hot tubs with built-in cup holders are convenient, keeping drinks within arm’s reach and minimizing the risk of spills, which is key in keeping your water crystal clear. Likely, one of the reasons you’ve either bought, or are considering buying, a hot tub is to entertain. Be certain to consider options that will allow you to get the most out of your investment. But Wait, There’ So Much More! Your goal is to create the ultimate outdoor man cave, right? Consider some of these ideas that will make your back yard the envy of your neighborhood. 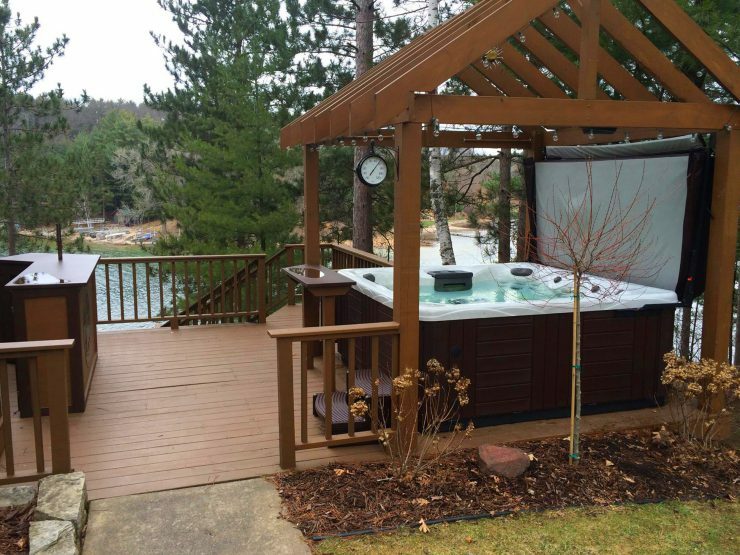 Incorporating a gazebo will keep your hot tub covered so that it can be enjoyed in any kind of weather. Most everyone loves to barbeque, so transforming your space into an outdoor kitchen with stone masonry and a refrigerator (perfect for stocking your favorite drinks) will further maximize your time outside. Or, let’s be real visionaries here, and imagine converting your shed into an outdoor bar, complete with bar stools, taps and plumbing. Building a fire pit close by, or attached to the hot tub, adds even more ambiance and warmth. The opportunities are endless when you consider that your back yard is a blank canvas just waiting to be transformed into the perfect man cave. Purchasing a hot tub opens a world of possibilities. From choosing its placement, to designing the surrounding landscaping and décor, the creative options are endless, especially considering your options to install it above ground or below, or surrounded by a deck or encased in stonework. You can also frame your hot tub with Vegas-style cabana curtains, build steps up to it or build the hot tub into a whole seating area with comfortable pillows and cushions. If you enjoy gardening, building planter beds around the perimeter of your hot tub can add beauty, as well as create privacy. By implementing a few simple additions to your hot tub landscape, your backyard will transform from a place where you simply mow the lawn into a place you truly want to spend your free time. 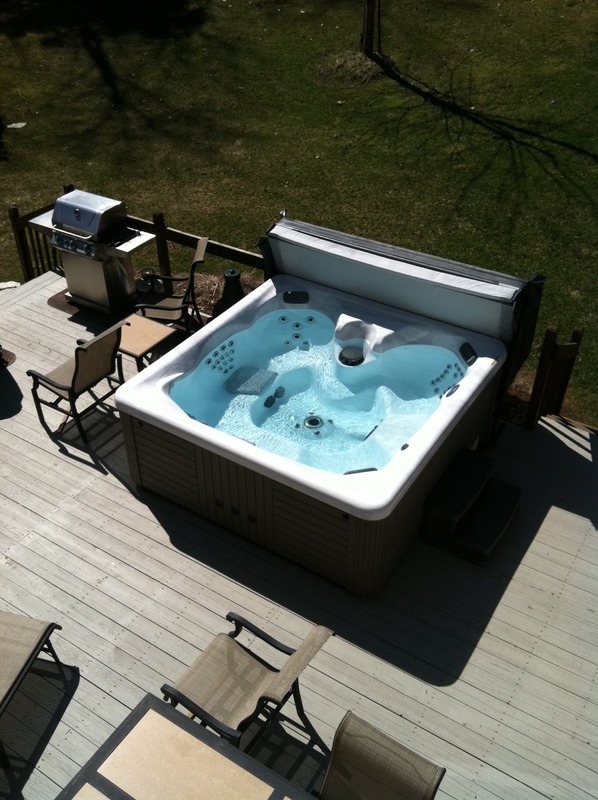 For more hot tub installation and landscape ideas from Master Spas, check out our Backyard Hot Tub Planning Guide.